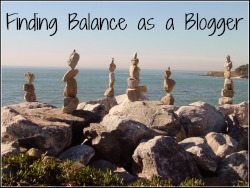 Gather a few bloggers together and the question of finding balance will come up every single time! I am not going to say that I have achieved balance, but I wanted to share a few things I have come up with that have helped. Unless they are really making it worth your time! Make a rough outline of your blogging plan based on your knowledge of your readers and their interests. And don’t change it to fit into another blogger’s schedule. Just because a blogger, even a big blogger, declares a “month of decluttering”, a “clear out the pantry month”, or “Julia Child Recipe Round Up” does not mean you need to participate. You can simply say, “that is a lovely idea, but it doesn’t fit in my schedule at this time”. Remember, those bloggers made their plan a while back based on their blogging goals and their readers interests. They didn’t consider your blog plan, so don’t stress yourself out trying to change your blog plan to participate unless it fits in with your goals and fairly closely matches your plans. You don’t have to squish every thought, recipe, and project you have ever had on a particular holiday in to one month of posts. Share what you can reasonably share and still keep your sanity. Then write down the other ideas for the next month or year. Did you have things you wanted to write about for Christmas, but didn’t have the chance? Don’t fret, but don’t post those posts 2 days before Christmas or worse a week after Christmas! A post written after the fact is fine, if you are sharing Christmas pictures with Grandma, but it is not useful to readers who are looking for timely resources and tips. Write the post, include the pictures and schedule it for early next December. You will be so relieved next December when you discover those scheduled posts. I wrote and photographed my Hoppin’ John Recipe on January first two years ago. Since it is a traditional New Year’s Day meal, it wouldn’t have the same impact if I shared it on January 2nd of 2012 as it did when I shared it in late December 2013 shortly before New Year’s Day, right about the time people would be thinking about their New Year’s Day Menu. I was a contributing editor for a political magazine and yet I choose to write about recipes, gardening, and frugality. Why? Because that is what I enjoy. It is what I do in my spare time. It is what I would choose to do, if I could choose to do anything I wanted. I am very lucky that I get to do what I enjoy and have the luxury to write about it. Writing about what I enjoy makes blogging an extension of a pleasurable activity rather than a chore. If blogging has become a chore, evaluate what you are writing about and see if you can find more ways to write about topics that you love. This tip won’t work for everyone, but it does work for me. I blog from my life; I don’t create content. I don’t buy special ingredients for fancy recipes, I don’t publish difficult recipes, and I don’t create beautiful tablescaped backdrops for my recipes. I admire people who do, but that is not my life. It would be a lot more work and it wouldn’t be authentic. I simply take a few pictures of the food I serve my family and remember to write down the ingredients and steps while I cook. This can be applied to many other projects in your daily life from cleaning, to crafting, to gardening. If you blog about what you are doing, it is easier to create balance. Instead of “working”; I am “documenting” aspects of my life. Great content and useful tips are often buried in lengthy posts. By breaking the lasagna recipe into multiple posts, I make it easier for people who are searching on an aspect of one of the steps in creating lasagna to find the information they need when doing a Google search. I also happen to make my life less stressful, because it is easier to write several 300 word posts that it is to write a thesis on lasagna. Unless you’ve signed a contract, you can post whenever you want and as little or as much as you want. You don’t have to post every day. In fact, I know very successful bloggers who only post once a week. So don’t beat yourself up, if you don’t have the time, energy or desire to publish a post each day. It is your blog, you are the owner and editor, which means you can set your own schedule. Don’t stress yourself out trying to keep up with someone else’s schedule or trying to follow another blogger’s plan! Only you know your goals for your blog and how they fit in with your “big picture”, and you will never reach your goals following someone else’s plan. How do you find balance as a blogger?